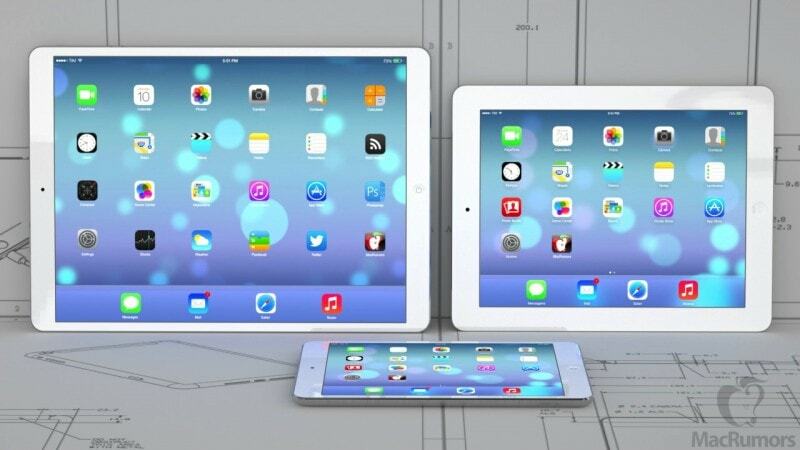 A new round of rumors are circulating today concerning Apple's long-rumored iWatch and 12.9" iPad. While I usually don't comment on implausible and unsubstantiated hardware rumors, I'm going to break with my rule against reporting on rumors and point out just how implausible the latest rumors really are. Apple is planning to launch three versions of the iWatch in the third quarter of this year. The lineup is said to include a model with a 1.6-inch display and two models with 1.8-inch displays, with the high-end version of the larger size coming with a sapphire display cover for durability. Today's report is set in the context of Apple adopting new touch technologies from TPK, with sources also claiming Apple's rumored "iPad Pro" with a display of 12.9 inches will finally be made official later this year. While there is some doubt in the blogosphere as to whether we will see the 12.9" iPad this year, pretty much everyone assumes that Apple will launch an iWatch. We haven't seen nearly enough hardware leaks to confirm that these devices exist outside of the collective imagination of bloggers and analysts. And just to be clear, I am not talking about the rumors being spread, but actual leaks, including info from named inside sources (analysts don't count) as well as images, diagrams, and other tangible evidence. As of July 2014, I have seen exactly one hardware leak for the 12.9" iPad and a grand total of zero leaks for the iWatch. Sure, bloggers have been writing about this or that detail, but they had no images, components, diagrams, etc to back up their words. The only leaked component I have seen for the 12.9" iPad was an unidentified chunk of metal which may or may not have been a raw shell. But since there was no first-hand info on it, it might actually have been some metal worker's idea of a practical joke. We simply don't know. And since there is even less to back up the iWatch, I remain unconvinced that either device will launch this year. I could be wrong on this, but when I read what is being said about the iWatch and compare it to what we know about the new iPhone and iPad Air, I don't think I am. Remember, we have seen numerous leaked components for a new iPhone with a 4.7" screen, and we've seen more than a few leaks which suggest the next iPad Air will be thinner than the current model. I have only reported on a tithe of the leaks, but trust me when I say there were a lot of them. And so I don't think there's going to be an iWatch this year, or a 12.9" iPad. What do you think? What amazes and also worries me–considering how much of my pension investments depends on the stock market– is that if Apple does launch the iPhone 6 in September but doesn’t launch a watch at the same time their share price will tank because all these pundits, as you suggest, have no clue what they are talking about. In fact, you could see the conversation go like this. LOL Yes, I can picture that conversation without any trouble. Many analysts faulted Apple for not releasing the cheap plastic iPhone last year, even though Apple never said they would. Like the iWatch, the cheap iPhone idea was an invention of the blogosphere and analysts. Oh, and the only changes I expect for the iPad is a new fingerprint sensor (like the 5S), and a faster, low-powered AX7 chip. I imagine everything else will more or less stay the same. The real big change is going to be on the software front.